How can sustainability officers get environmental and social issues onto the board agenda? Ceres’ Veena Ramani offers some practical advice. I’m not suggesting that every sustainability challenge merits board attention, but when an issue materially could affect corporate performance or value, it belongs on the table. Sustainability officers at companies have a key role to play in driving the understanding of what should rise to the top. When an issue materially could affect corporate performance or value, it belongs on the table. So how can sustainability officers do a better job of elevating relevant issues to their boards? Here are a few ideas based on my 10 years of work on integrating sustainability into corporate strategies and bottom-line performance. Corporate secretaries act as intermediaries to corporate boards and work closely with the CEO and the board chair to decide when and how issues get on the board agenda. A key role of the corporate secretary is advising the board on how they can discharge their responsibilities towards shareholders, which is why the CS and investor relations departments work closely together. Sustainability officers could engage the CS and IR by demonstrating that the company’s ownership is starting to pay attention. In fact, companies such as EMC and Intel have explicit board sustainability oversight systems in part because of engagements with shareholders. We’ve seen record-breaking growth in investors caring about sustainability (PDF) writ large, as well as investors specifically focused on the role of the board for sustainability (PDF). Large institutional investors such as CalPERS, CalSTRS and State Street Global Advisors (PDF) even have set public expectations on how corporate boards should be elevating their focus on climate change. That means understanding the board committees, including their composition and charters. It also means knowing what issues the committees are already focused on. 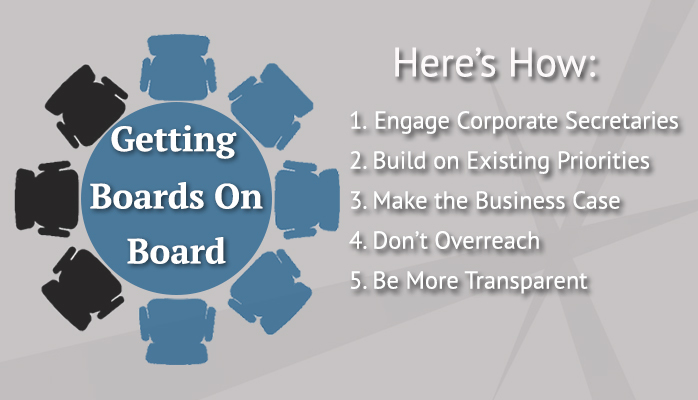 Given time constraints on a board’s agenda, rather than trying to add a new item for the board to consider, consider how sustainability can be folded into a discussion the board is already focused on such as evaluating the business model and supply chain risks or workforce retention. For instance, investors are looking to engage with the boards of energy companies on climate-related issues given the major impacts on their business models from carbon-reducing regulations and other carbon-reducing trends. Ceres recently updated its Ceres Roadmap for Sustainability to call on boards to integrate sustainability into discussions on strategy, risk and revenue. In fact, as my recent View from the Top report points out, risk and revenue are the most direct routes for getting the board to focus on a sustainability issue. Dan Henkle, senior VP of global sustainability at Gap, suggests that in some cases, sustainability officers can use “points of pain” to frame sustainability from the risk perspective and engage the board and the CS on how these risks can be mitigated. This also could be a way to translate sometimes theoretical ideas into practical impact. Whether and how sustainability should be elevated as a material issue is a subject of intense investor focus. “They need to touch and feel what you are talking about,” he noted. For instance, many companies recognize the need to conserve water for environmental reasons. But where water scarcity is linked to cotton production, the impacts become much more tangible to an apparel company. Partnering with colleagues from the business side in this process also can be helpful. For instance, Nike’s Board Sustainability Committee is jointly staffed by the company’s chief sustainability officer and chief operating officer. Executives often appear before the committee to discuss how sustainability and business strategies are aligned and how this is reflected in the work of the teams that they lead. As noted earlier, it all comes down to materiality. In View from the Top, we underline that rather than engaging boards on sustainability writ large, it is most effective to get them to focus on specific environmental and social issues that materially could affect the company’s short and long term value. Most companies that publish sustainability reports have a process to determine material sustainability issues. But these efforts rarely inform board level discussions because they are not considered to meet pre-determined financial and regulatory thresholds. Whether and how sustainability should be elevated as a material issue is a subject of intense investor focus, with many investor groups, including Ceres, filing input to ratchet up the Securities and Exchange Commission’s attention to this issue. One way sustainability officers could bring these worlds together is to explore opportunities to emphasize the focus on “impact on corporate value” as a part of the materiality process. Given that sustainability officers typically lead the reporting function at companies, one tactical option is to advocate to have the board chair include a message in the sustainability reports. For instance, EMC systematically maps its material sustainability issues to the company’s major strategic themes, allowing for more integration into business priorities. The company also includes its board in materiality exercises, and revises key issues identified based on board feedback. Prudential Financial emphasizes the importance of getting material sustainability issues included in financial filings as a way to get sustainability issues in front of the board, which reviews such disclosures. Its annual financial proxy includes details (PDF) about the company’s environmental and sustainability efforts and features a board qualifications matrix that specifically pulls out board member expertise in sustainability and social responsibility. Companies could do a much better job of telling the story of when their boards have been engaged in thoughtful oversight and decision making on key sustainability issues. Interest is growing in an initiative led by Harvard professor Robert Eccles calling for boards to release an annual Statement of Significant Audiences and Materiality, laying out whom the board considers to be a company’s primary stakeholders and corresponding matters that the company prioritizes. Given that sustainability officers typically lead the reporting function at companies, one tactical option is to advocate to have the board chair include a message in the sustainability reports. Many European companies routinely have their CEO and board chair sign off on the leadership message in these reports. The bottom line is that the sustainability officers have a big task in front of them in getting their boards on board — especially at U.S. companies — to focus on sustainability challenges with the urgency that these issues deserve. Companies such as EMC, Gap Inc., Nike and Prudential are showing strong leadership in elevating these issues and I hope more companies will learn from them. Veena Ramani is a Senior Director in Ceres’ Corporate Programs. This post is republished from Corporate Citizenship.